Trapper Creek…The intersection of a rich future with a true Alaskan legacy from the past. Centered near the crossing of two roads, one old and one newer, Trapper Creek has a history that matches these roads. Without these roads there is little doubt that the community of Trapper Creek would not have either a history or a future. The old road, known now as the Petersville Road, was started back in 1917. The newer road, known as the Parks Highway was opened to traffic as far as the Petersville Road in the late 1960’s. Together these roads have formed the Trapper Creek we know today. Prior to 1917 the land across the Susitna River from the mouth of where the Chulitna River and Talkeetna River joined the Susitna knew only the footsteps of the Dena’ina native people. They had hunted and fished along the streams such as the one now referred to as Trapper Creek for centuries. No evidence shows that they had any long term settlements within the area of present day Trapper Creek. But, without a doubt they knew the make up of the region and where to find the abundant fish and game for their subsistence. Then, the first white explorers arrived. Men like W.A. Dickey in 1896, who named Mt. 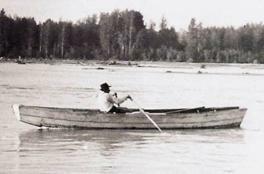 McKinley, and Lt. Learnard in 1898, of the U. S. Army, traveled up the mighty Susitna passing the area now encompassing Trapper Creek. They left only small foot prints on the land not staying long in the region below the great mountain known as Denali to the Dena’ina peoples. The first semi-permanent inhabitants appear to be the trapping brothers Oliver and Noah Rabidoux. Sometime after 1909 Oliver built a cabin on the headwaters of the creek bearing his name very near the heart of modern Trapper Creek. They and other trappers found the land rich in fur. The Rabidoux cabin ruins remain to this day as a monument to this hearty breed of local pioneers. But it was gold and the building of a rough wagon road that finally brought larger numbers of people through the region of Trapper Creek. Gold had been discovered in 1905 in the Cache Creek mining district some 45 miles west of the Susitna River. The route from the south, to these mines, was a long and difficult one. Miles of river travel and an imposing trip overland made the trip a hardship for the miners. It was the construction of the Alaska Railroad and the establishment of Talkeetna on the Susitna River that led an early day miner, Henry Bahrenburg, to lay out a new short trail leading east from the Cache Creek mines to Talkeetna in 1917. Soon the Alaska Road Commission improved this trail into a wagon road. This old wagon road now bears the name of the Petersville Road. With the building of the road the future of Trapper Creek became a possibility as it passed directly through the heart of the land comprising present day Trapper Creek. The land along the start of this road was found to be fertile and good for homesteading. Plus it was close to a supply point, Talkeetna that lay just across the Susitna River from “The Landing” where the Petersville Road started out to the west towards the Cache Creek mining district. Shorty Bradley became the first to settle long-term in about 1939. 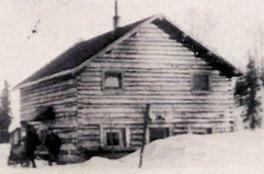 He staked a homestead along the Petersville Road a few miles west of “The Landing” and is looked upon to this day as the “father” of Trapper Creek. In the years to follow other homesteading pioneers would join him in staking and proving up on the good farm land near his. The old road continued to lure folks to the area with a fresh influx coming in 1959 when a group from Michigan, known as the Michigan 59’ers came across the ice from Talkeetna and staked more land along and near the Petersville Road to the west of Shorty’s original homestead. Some stayed and some left but their influence continues to this day in the form of road and place names. Now, the final step that formed Trapper Creek as a true community occurred. The new Parks Highway stretching from Anchorage to Fairbanks was completed as far as Trapper Creek in about 1968 with a bridge finally being built over the imposing Susitna River. The point that it crossed the old Petersville Road was in the same area that Shorty and the other homesteader’s had settled over the years. The intersection of the two roads, old and new, made for a natural spot for the community to continue to grow. With the discovery of the great recreational opportunities abounding in the local area growth for Trapper Creek, now and in the future, was assured.